Latin rather than any vernacular version assures accuracy in the transmission and correct understanding of information. It follows that, where there are discrepancies between the Latin and vernacular, the corresponding Latin version predominates. A rigorous study of Tra le sollecitudini (TLS) would confirm that it is riddled with ambiguities, nuances and concepts not found in the Latin text. So, those unwise enough to rely on the various vernacular interpretations of TLS have only second- third- and-fourth-hand corruptions of the Latin, with each version diverging further from the original. It is not difficult to envisage how the liturgical reforms have been affected by decades of linguistic misunderstanding on the part of Pastors who had never consulted the normative Latin source, and who were dependent on corrupted translations. They simply relied on whatever the progressivist reformers had told them. 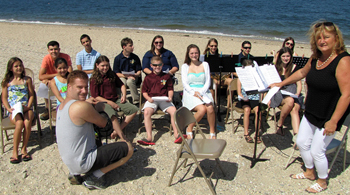 As a result, “active participation” was eventually taken for granted by all Novus Ordo priests, despite its capacity to overthrow the objective liturgical tradition and the rubrical framework that held it firmly in place. Such a system has the obvious potential to be exploited in order to meet the reformers’ perceptions of the “good of the Church” – a phrase used in Sacrosanctum Concilium (§ 23) as an excuse to introduce “innovations.” But without accurate information, how could those responsible for liturgical reforms make sound decisions consonant with the Church’s self-understanding? Reliance on faulty translations was never the practice in any area of ecclesiastical life before Pius XII’s reforms. Traditionally, the Church used a method of interpretation known as exegesis, which draws out of the Latin text the meaning its author meant to convey. On the other hand, there is the method called eisegesis, whereby the translator introduces his own presuppositions and biases into the text by “seeing” what he wishes to find in it, e.g. “actuosa” (active). This involves reading into the text what is not there. This was the preferred method of the liturgical reformers who set out to “prove” what were really only their own subjective notions and pre-held agenda for “active participation.” Even today, they obsess so much about the word “active” that they miss the whole point of the motu proprio. It is understandable that actuosa (active) was not used in the Latin version of the motu proprio for the following reasons. First, because the word lends itself to a vague and general interpretation: Its very fluidity would have made the application of the law not only problematic in its own day, but also subject to a broad interpretation by future lawmakers. And indeed, as recent history has shown, the range of possible interpretations of “active participation” is limitless and continues to expand exponentially. Nor is it possible to contain or control its expansion without nullifying Article 14 of the Liturgy Constitution, which declared “active participation” to be the overriding goal to which all other considerations are subordinated. Second, “active participation” is based on a falsehood, the principle of relativism, whereby the liturgy handed down through the centuries is adapted to the subjective and changing perceptions of the people participating. These vary from parish to parish, from one Novus Ordo Mass to another, depending on how each Liturgy Committee assesses a particular group’s cultural norms and values. To illustrate the point, we will make use of the Medieval adage, ex falso quodlibet (“from a falsehood, anything follows”), meaning that once a contradiction is admitted as truth, any conclusion, however nonsensical, can logically be derived from it. As an aside, we can see how this worked in practice as a direct result of the false principles ‒ “opening to the world,” “ecumenism” etc. ‒ introduced by Vatican II in contradiction to the Church’s Tradition. The ensuing toll of destruction speaks for itself. When applied to the Novus Ordo liturgy, this principle explains the logical underpinnings of the regime of novelty. Once “active participation” is accepted as an authentic and indispensable method of lay involvement in the liturgy, any activity – no matter how inappropriate, sacrilegious or offensive to morals – flows logically from the false premise. Even though the logic of the liturgical reforms makes sense within its own terms of reference, its starting point (“active participation”) was wrong. So, its conclusions (the practical consequences as evidenced in the Novus Ordo Masses) were also wrong in spite of the correctness of its logic or, rather, because of it. This principle also explains why so many Churchmen see nothing at all amiss with the routine irreverence displayed during the liturgy, especially to the Eucharistic Presence, and do not “see” the most outrageous examples of profanation, even though they hit you right in the eye. These are the inevitable outcomes of the all-encompassing directive of Vatican II’s Liturgy Constitution, which makes “active participation” the primary consideration of the liturgy. Those who enact it are, after all, only obeying the logic of the reforms and are convinced they are perfectly correct. Providentially, there is no such tripwire in the Latin motu proprio of Pius X. But the traditional Roman Rite, which had withstood the test of time and was fine-tuned to be quintessentially Catholic, had a logic of its own, which was understood (alas, this is no longer the case) by all practicing Catholics, no matter what century they lived in. That was precisely the logic of Pius X’s motu proprio. In the Introduction the Pope singled out from among his many concerns the one that was of the greatest importance: (6) to promote the “decorum of the house of God” and the solemnity and splendour of the ceremonies. Therefore, he said, nothing should take place that would disturb or diminish the prayer and piety of the faithful who participated by drawing spiritual sustenance from the actions of the priest and his ministers in the sanctuary. 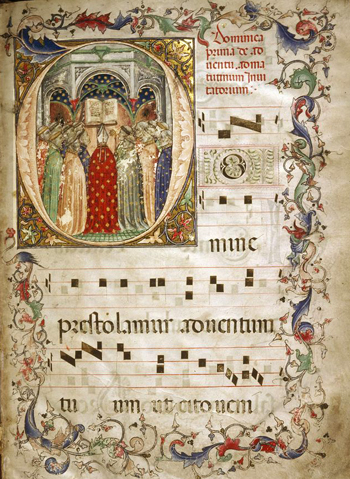 But then, as far as the liturgical reformers were concerned, the question of fidelity to Tradition was academic. Neither ethics nor truth was required, simply the strong arm of the law. But, where is the logic in funding one’s own destruction? 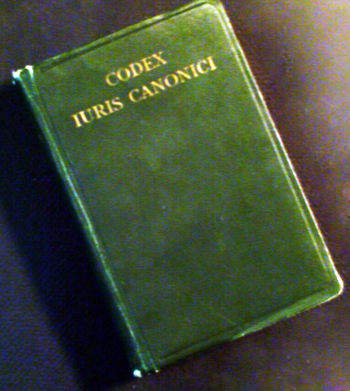 The Pio-Benedictine Codex Juris Canonici (1917) was drawn up by Pius X and promulgated by Benedict XVI. St. Thomas More, The Confutation of Tyndale’s Answer, in The Complete Works of St Thomas More, ed. Louis Schuster et al, vol. 8, book 1, New Haven: Yale University Press, 1973, p. 111. 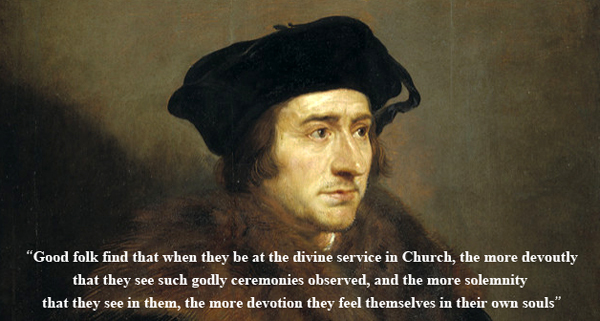 St. Thomas More, ibid., vol. 8, book 2, p. 161. The English mistranslation refers to this concern as “a leading one,” implying that there were others of the same ranking, such as “active participation,” but Pius X had left no room for equivocation: “illa principem tenet locum” (this one holds the highest place). J. D. Crichton, The Church’s Worship: Considerations on the Liturgical Constitution of the Second Vatican Council, New York: Sheed and Ward, 1964, pp. 68-69.